Finally the rain has stopped. We can now thank the Lord that the rains and floods will subside in our country and that finally we can move forward after this. I look around at the internet and see the photos of houses and businesses destroyed or ruined by the flood. Families with ruined appliances and houses ravaged by the flood or in dire need of repair. Definitely the next challenge that most of us have to face after this tragedy is to rebuild and refurnish. Unfortunately for most of the middle and lower class sector, many would need to raise money to accomplish this. This is where Lenddo, the world's first online platform that empowers the emerging middle class by giving access to financial services such as debt consolidation, business loans, or cash loans. All you have to do is build up your reputation and credibility through your social networks like Facebook or Twitter to apply for a loan. 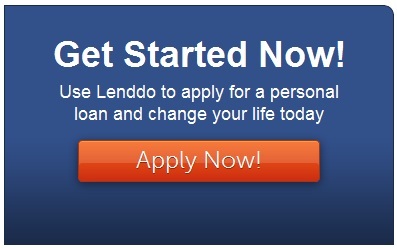 There is NO COST to join Lenddo and get business loans or cash loans. 1. Go to www.lendo.com.ph and click the Apply Now button. 2. Fill up the information with your complete name, email address, password, gender, birthday, and mobile number. Check out my Lenddo Profile here. Click LOANS to find out if you can get a loan already. 3. Once filled up, you will then land on Lenddo's dashboard. Then go click the LOANS tab. There you will see the requirements needed to get a loan. The first requirement to get a cash loan is to raise your Lenddo score to at least 400 points. This is the part where Facebook, Google, Twitter, Yahoo, and even Linkedin can help you. You will have to start linking your accounts to Lenddo to build up your credibility and your Lenddo score. That is why it is important for you to be transparent, to be honest, and to be engaged. The more social network accounts you link to Lenddo, then all the more will your Lenddo score increase. 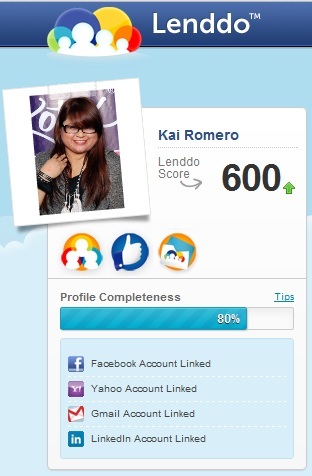 My Lenddo Profile - I got score of 600! I linked my Facebook, Yahoo, Gmail, and LinkedIn accounts to increase my score! 4. Then BUILD up your trusted network. Invite your family, co-workers, or friends to join Lenddo and get a Lenddo score of 400 as well. Inviting these people helps increase your Lenddo score and also fulfills the requirement of getting a trusted network for your Loan. A trusted network simply means that these people will vouch for your and you can also vouch for them. Just be reminded that these people that you add to your trusted network are people whom you can really trust. Don't worry, they won't be asked to be your co-signor. For clarifications and more information about this, kindly visit the Lenddo FAQ Section. Or better yet, check out this slideshare that will give you a picture how Lenddo works. I know this sounds too good to be true especially for those who need money or to get a loan at a short amount of time. I too was skeptical at first, but then I checked out the Lenddo Facebook account. I also read the testimonials given by people who have already tried Lenddo out. Too good to be true? Well, that's what one of them said but it happened and it worked. I for one haven't tried getting a loan yet at Lenddo. I'd probably get a loan here one day when the time comes when I need a cash loan asap. Maybe Lenddo could improve further in their security and assurances that the information shared to them will be kept absolutely secure. Imparting such information makes me uncomfortable. I've been taught to be very cautious on what information I should be wary on sharing online. Though I understand that Lenddo needs a lot of information about us--that we be transparent to them as much as possible so that they will also be assured that we will uphold the other end of the loan which is paying them back. So as a reminder, make sure that when you take a Lenddo loan, you are absolutely certain that you can pay them back else they will take legal actions if payment is not made. Still this has not deterred others to get a loan. Some have even took a second loan. Wouldn't it be great to get to access this kind of financial service as well? One huge factor for me joining and getting a Lenddo loan is the fact that it is FREE plus you don't need a guarantor to get a loan! In the previous school that I worked for, I had to get a guarantor to get any kind of loan at the school coop. I wasn't too thrilled with that coz in return, I had to guarantee the person who guaranteed me. Since I was a new teacher, I didn't know my co-teachers that much during that time so I wasn't confident enough in guaranteeing them that they'd pay up. I had to forego in getting a loan and so I didn't push through with my plan on taking up my Master's degree during that time. So I'm glad Lenddo is now providing these kinds of services to people who need it for debt consolidation, personal loans, and business loans. I'm sure it would be a big help to all especially now after what happened during the flood this week. So what do you think Coffeeholics? Wanna check this out? Well, if you are in dire need of cash why not eh? Just remember to be smart, be aware, and be responsible especially in your financial obligations and transactions. Lenddo can help you especially if you do your part. 5th Phil-Cosmetics Expo - BE THERE!